Congratulations to Brandon M. Ward of Clinton, Tenn.! 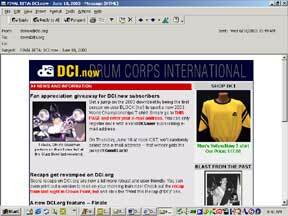 Brandon is this week's DCI.now giveaway winner, and he'll receive a copy of the 2002 World Championships DVD. "Awesome!" Brandon wrote upon discovering he was the winner. How do you get to be eligible for these weekly drawings? Register to get DCI.now!